The Drain Brain is a drain and sewer cleaning service established in 1976. 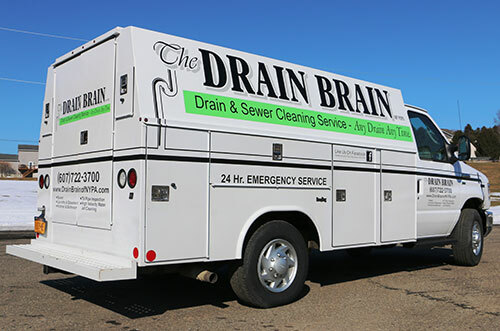 The Drain Brain specializes in cleaning drains of all sorts and sizes, and services residential, commercial and industrial accounts throughout the Southern Tier of New York and Pennsylvania. Utilizing mechanical means and high pressure water jetting The Drain Brain has a reputation of not only being able to clean out the most difficult drains, but does so after other drain cleaners have tried and failed. We also investigate, identify and document defects in piping utilizing specialized camera equipment as well as have the ability to locate and trace drains as required. We were the first drain cleaning company in the Southern Tier to offer camera inspection, and have actually made our own devices or modified others to suit our needs. Being able to identify the real source of the problem enables us to develop a viable solution for the client, saving them time and money, and restoring function to the drain. Because we focus on these areas, our equipment is designed for these functions and our experience sets us apart from other cleaners in the Binghamton area. We are generally able to perform the job in less time with less mess and leave the client’s location without them ever knowing we were there, except that the drain works when we leave. We guarantee our work anywhere from three to six months depending on the size of the pipe and work performed. The methods that we utilize are time tested and we stay abreast of equipment upgrades and improvements. The Drain Brain continues to enjoy a well respected reputation in the industry with established accounts, contracts, and referrals from several well known and successful plumbing businesses in the area who do not wish to perform this kind of service. While we have a defined service area, we have never limited ourselves to any geographic area. If the client is willing to pay the rate quoted (travel included) then we will go just about anywhere. We are proud to routinely provide services to larger industrial clients and facilities including, but not limited to: Binghamton University (Vestal, NY), Kraft Foods (Walton, NY), Corning Glass (Corning, NY), Tri-boro Municipality (Susquehanna, PA), BOCES (Masonville, NY), NYSEG (Greater Binghamton Area) and many others.